Research in Psychotherapy is a comprehensive synthesis and assessment of the psychotherapeutic research literature for the use of both researchers and those in clinical practice. It is designed as a general reference work, an instruction guide, and a source of information about specific aspects and problems of research. The book consists of three parts. 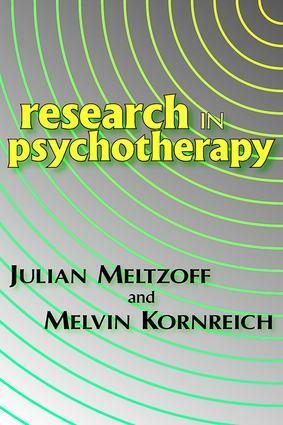 Part 1 discusses principles and methods of research as they are applied to psychotherapy. It provides general background material and principles to help non-researchers appreciate some of the important problems that are encountered. In Part 2, existing research on the effects of psychotherapy and the determinants and correlates of outcome are clustered and reviewed. Chapters 4 to 7 are concerned strictly with a review and appraisal of controlled studies that were designed to evaluate the effects of psychotherapy. Chapters 8 to 13 deal with a large body of research on various factors associated with therapeutic outcome--method, style, and technique variables; patient, therapist, and time variables. Part 3 is concerned with research on aspects of the therapeutic process and on the effect of many of these same variables on the therapeutic interchange as distinct from the outcome of therapy. Also discussed is research on various therapeutic phenomena and conditions about which so much has been written and so little really known. Research in Psychotherapy was written in the conviction that clinical practice should be influenced by research and that rigorous research that meets acceptable experimental standards can be done on the field of psychotherapy.